Tollesbury Wick Marshes01621 862960work Nature ReserveWildlife is abundant in the 600 acres of rough pasture, borrowdykes, sea walls, wet flushes, pools and saltmarsh. Large areas of rough pasture suit small mammals such as field vole and pygmy shrew. In winter, they in turn attract hunting hen and marsh harriers and short-eared owls. Dry grassland on the slopes of the sea walls supports a wide variety of insects, including butterflies, bush crickets and grasshoppers. In spring spiny restharrow, grass vetchling, slender hares-ear and many other wild flowers can be found in ungrazed areas. 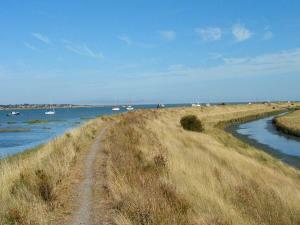 Borrowdykes trace the inland edge of the sinuous seawall for its entire length. Common reed, sea clubrush and fennel pondweed are typical plants of these brackish areas where reed warbler and reed bunting nest in spring, and heron and little grebe search for food. Wet flushes, dykes and small pools in the pasture support aquatic plants such as water crowfoot, and breeding populations of dragonflies and other aquatic species. Golden plover, lapwing, brent geese and wigeon feed or roost on the winter-wet grassland. On the other side of the seawall, and within the reserve boundary, creeks, salt marsh and exposed mud support typical communities of coastal mud-dwelling invertebrates, coastal birds and salt marsh flora. Scattered shingle spits have yellow-horned poppy, and also a small breeding colony of little terns. Wildlife is abundant in the 600 acres of rough pasture, borrowdykes, sea walls, wet flushes, pools and saltmarsh. The main pillars of management are water level control and getting the right level of grazing to create suitable conditions for birds and other wildlife.